"Love for a Nation" is a very strong words when heard or seen conspicuously with its true meaning being portrayed in every nook and cranny in Biafra land. Biafrans who are outside and within Biafra land are possessed with the spirit of their beloved Nation to the extent that they can do absolutely anything for Biafra restoration. It is quite amazing that amidst all the clear evidences of their love for Biafra, Some uninformed and misinformed individuals still ask questions like: Why do this younger generation so much take the restoration of Biafra upon themselves? Why is it that every discussion amongst them is centered on Biafra restoration? On the other hand, some confused fellows still went ahead to ask: why do they think they can restore Biafra when their fathers couldn't? Obviously, the answers to these questions are very simple for sensible individuals to comprehend. The issue of Biafra is like a house project. When a man's house is destroyed as a result of circumstances or invasion, he decides to rebuild his house. If he dies in the process due to internal enemies who are determined to plunder his land and properties then it is the duty of his children who were kids when their father failed or died trying to rebuild their home, to take it upon themselves as a compulsory task to finish the project their father started. It is total madness and display of insanity for anyone to ask them why they want to finish the project their father started. This is why the younger generation is not left out. 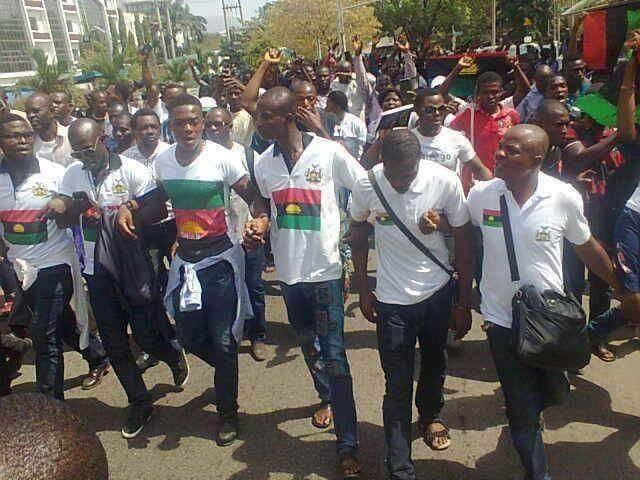 They intend to maintain continuity for the "the love of their Nation- Biafra". There are many Biafrans who are desperately thirsty for and to behold the freedom of Biafra, hence their reason for taking the restoration of Biafra upon themselves as a priority. They are fearless, relentless and more determined to restore Biafra no matter what it takes. The journey for the restoration of Biafra is like a golden footprint on a rock which cannot Be washed away by storm. In history, no other Indigenous People have gone through wars which cost them all they had and still come out to seek for that which cost them all they had. None have experienced the inhumane treatments/undeserved pains and still rise their voice for same which led to the disaster. Again, none have seen the corpse of the people who died for what they want and still go ahead to demand and fight for the same thing. That is what we mean by being formidable and resolute! When Biafrans chant the slogan "BIAFRA OR DEATH", they mean every word. No reasonable human being can ever think of stopping or hindering it's restoration by means of intimidations, subjection, in humane treatments and killings of Biafrans. The more Biafrans are killed, the more they increase in number because they are like viable seeds planted on a fertile ground (truth) that grows every day. Millions of Biafrans killed during the war, cannot be compared with the number of Biafrans on earth today because they are ten times larger, more intelligent and united. The enemies of Biafra couldn't stop Biafra then and they won't stop now because the game has changed, the music is loud, the dancing step is more modified to a different and strong dimension. Let those who think they can stop the restoration of Biafra, first pull down the sky, let them stop the time and destroy all the creatures on earth, else as long as the earth still exists and the sun still proudly rise every day, Biafra must be restored - Land of the Rising Sun we love and cherish! Time is up for our youth to continue to live as slaves in their God-given land flowing with milk and honey. It's time to liberate Biafra land from Hausa-Fulani and Yoruba hegemony. We must either get our freedom or perish than to continue to live as slaves in our own land. Tufiakwa!